Walter Perry Johnson, commonly referred to as “Big Train” for his large stature and fast pitches, was born as the second of six children to Frank and Minnie Johnson on November 6, 1887 in Humboldt, Kansas. His childhood years were spent in rural isolation on his family farm. He found that living in the country away from the hubbub of city life he was able to learn more about himself. He liked the solitude of country living so much that in between baseball seasons he and his wife Hazel would return to their own working farm in Coffeyville, Kansas. While his roots were in Middle America, Walter did not develop his love and aptitude for baseball there. At the age of fourteen, Walter’s father Frank moved the family to Orange County, California in a town called Olinda to pursue a career in the oil industry. Like his father, Walter spent some time during his teenage years working in the oil fields. Among other pursuits, Walter enjoyed spending his time horseback riding and playing baseball. It was at Fullerton Union High School where Walter joined his first baseball team. In high school he tried out a bunch of different positions, but soon his natural ability for pitching became evident. One of his biggest high school baseball highlights was a fifteen-inning game against Santa Ana High School in which he struck out twenty-seven batters. Little did he know then that he would go on to become the greatest pitcher in baseball’s history. During his career as a professional baseball player, there were not accurate measuring devices available; however, it is estimated that he pitched an average of 97-99 miles-per-hour, which is an astounding 7-12 miles-per-hour faster than his contemporaries. Walter did not achieve fame and glory right away though. He was not scouted to play professional baseball directly out of high school. Instead, he joined a semi-professional league in Idaho called the Idaho State League for two years. While playing baseball in Idaho, word of mouth spread about his impressive fastball. Within one short year, he was recruited to play professional baseball by the American League’s manager “Pongo Joe” Cantillon. Unsure about leaving the comforts of rural Idaho, Walter declined Cantillon’s offer. Cantillon, however, saw Walter’s potential and tried again the next year by having Washington’s catcher Cliff Blankenship try his hand at persuading Walter to join the team. Blankenship succeeded at persuading Walter, so starting August 2, 1907 Walter began his twenty-one year career as a player for the Washington Senators. Too often when flipping ESPN on, egotistical athletes span the screen, but Walter was not one of those athletes. Not only is he known for his talented right-hand pitching, but more importantly he is known for being kind. Sportsmanship is an important part of team playing. For example in basketball the Miami Heat used to rely on LeBron James (before he left to play for the Cleveland Cavaliers) but did not play as well as a team; while on the other hand the Spurs have Tim Duncan who is a talented player, but they work better as a team as a whole. If LeBron James had been a better team player, then the Miami Heat could have performed even better. Walter was talented enough to carry the team on his own, but was also a good player which opened up more possibilities for the team as a whole to succeed. That is what brought the Washington Senators to the World Series twice. Walter’s sportsmanship and kindness were so notable that he received various nicknames associated with his characters. Those nicknames include: “Sir Walter,” “The White Knight,” and “Gentle Johnson.” These nicknames are significant because they shaped the way Walter, his team, and baseball were looked at. Many people, especially children, look up to athletes as role models. Because Walter had impeccable character, he was able to make being kind popular among the public. Walter grew up on a farm in the countryside of Kansas. His humble upbringing shaped the humility of his heart. For Walter, baseball was not about being better than other people; it was just about being better period. The fame and the glory of becoming a professional athlete was not a priority of his. When Joe Cantillon first approached him about playing for the Washington Senators, he turned down the offer. Walter was content staying in rural Idaho playing minor league baseball for the fun of the game. But one year later Walter reconsidered Cantillon’s offer and joined the team. Joining a major league baseball team though did not corrupt Walter’s humility. After playing for a few seasons, he was offered a significantly higher paid position to play baseball for the Chicago team. While a $13,000 pay raise probably was tempting, Walter was humble enough that the money did not matter to him as much as his teammates did. And for that reason, he declined the offer to play for the Chicago team. The story of Walter turning down the offer to play for the Chicago team is a great example of Walter’s loyalty. Walter was a loyal man, especially with regards to his team. He played for the Washington Senators for his entire twenty-one year career, which is remarkable. The Washington Senators had a reputation for losing and he was a good enough player to be picked up by a better team, but Walter chose to stick with his teammates. Even after retiring, Walter continued to stick with his team. He worked as the manager of the Washington Senators for a few years. And after leaving his management position in Washington to manage the Cleveland Indians, Walter returned again to work as a sports broadcaster for the Washington Senators. Walter was also loyal to his family and country living. Although during the season Walter lived in Washington, he did not let his city job take away from his country roots. He and his wife Hazel would return to their own farm in Coffeyville, Kansas until she passed away. When she passed, he took responsibility for rearing the children on his own. He did the same with his sister’s children when she passed away. He did not abandon them in their time of need, because his family is where his greatest loyalty lied. When it comes to caring for his family, Walter’s family was able to count on him. Walter’s wife died much earlier than could have been anticipated due to an unexpected instance of heatstroke. When she passed away, she left five young children behind, one of their younger children who is still living today, Carolyn, was only seven years old at the time. Many athletes might have been too caught up in their own pride to make the arrangements necessary to provide for their children’s material and emotional needs, but Walter was attentive to his children. He also took in his sister’s two children when they needed a home. As Carolyn recounts, they grew up in a happy home with a loving father. Walter was also reliable when it came to his career. Judging by the impressive statistics surrounding Walter’s career, it is evident that he was consistent. He didn’t have just one good play or one good season; his team could rely on him to work hard to continually improve as a player. Science-fiction author Brandon Sanderson has been known to say that writing is like playing a piano—you would not consider yourself a pianist after learning one song, and likewise you should not consider yourself an author after writing one book. The same is true for Walter’s baseball career. He was an athlete because his team could rely on him to play many good games over the course of his career instead of one good game per chance. 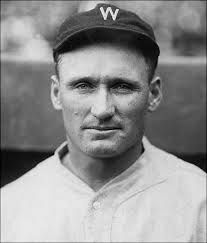 Raising a family as a single parent, running a farm, and breaking world records in baseball is hard work, and Walter Johnson stepped up to the plate, pun intended, for all those tasks. Each of those tasks are so physically, emotionally, and mentally demanding that an ordinary person would crack under pressure. Walter though did not crack, because his strong work ethic made him extraordinary. When it came to his family, he made sure he could spend as much quality time with his children as possible. When he couldn’t be with them, he recruited his mom Minnie’s assistance. But when he spent time with his children he made it about them, not himself. In fact, his daughter Carolyn recounts that at the time she knew little about what was happening with his baseball career, because her father focused on her interests over his own. Not much information is available about Walter’s farm other than the fact that he and his wife owned one, but when considering the work a famer has in general it is clear that Walter must have put a lot of effort into the farm to keep it running. Farming is not a very friendly pursuit for a busy athlete. The farm though was a priority for Walter and his wife, so in between baseball seasons they jetted back and forth to the farm to maintain it for the duration of Hazel’s life. On the topic of baseball, Walter spent many hours practicing the sport in high school, which led him to play a perfect game his senior year. That gave him the opportunity to play in the minor leagues in Idaho. While in Idaho, he continued to spend many hours practicing his game strategies that gave him the opportunity to play in the major leagues. His work in the major leagues won him much recognition in the form of records, awards, and monuments to his memory. Walter may not have attended college, however, he still was an intelligent man. He used his wit to run a farm, play baseball, raise a family, manage baseball teams, broadcast sports news, and pursue the world of politics. Only the best and the brightest become elected officials. People need to be able to trust their elected officials enough to vote for them. And Walter exhibited enough intelligence for the people to trust him enough to elect him, because in 1938 he was elected as the Montgomery County Commissioner. He ran for Congress a few years later and lost to the incumbent, but he showed enough promise to make it a close race. He was a smart man who continues to be publicly admired today.